Posted: August 23, 2018 in Fotos, Who,What,Where & When...? This whole online caper is interesting not least for the people you meet in the virtual world and as a consequence subsequently in the real one. 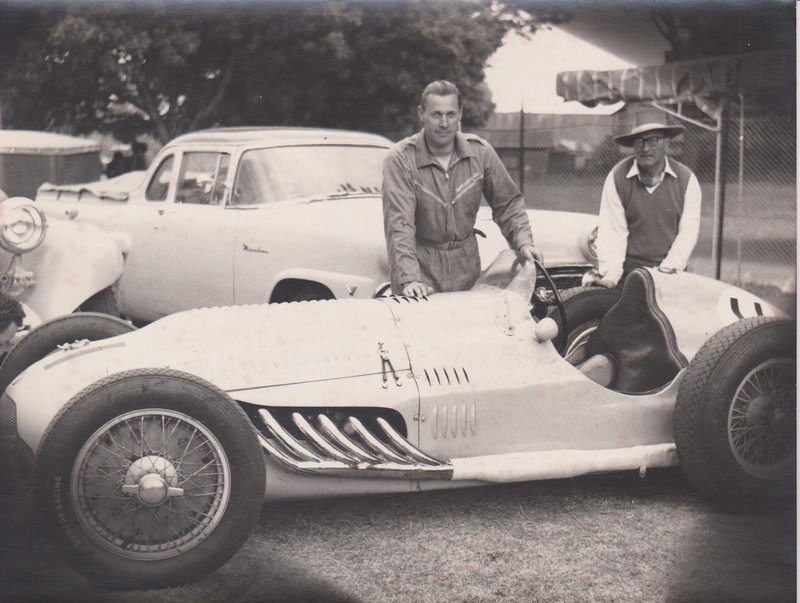 Greg Smith is one such fellow, he is a well known Melbourne racer/engineer/restorer who wrote an article for us a while back. We were discussing some arcane topic online the other week which led to an invitation to one of Smithy’s wonderful Wednesday night feasts in honour of the late Italian/Australian hotelier/racer/raconteur Lou Molina- who looks down on proceedings from the wall with approval at Greg’s execution of some of Lou’s Italian dishes. 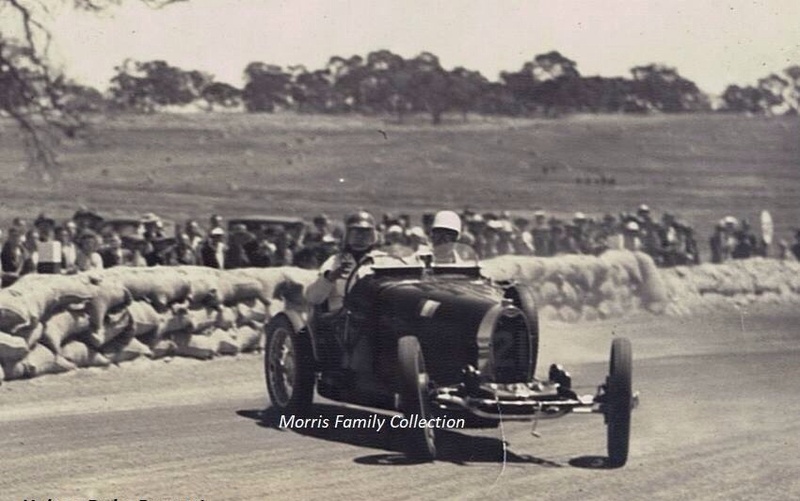 There were some fine car/racing identities there on the night including Perth boy Rod Quinn, and locals Ron McCallum, David Ogg and Bob King. 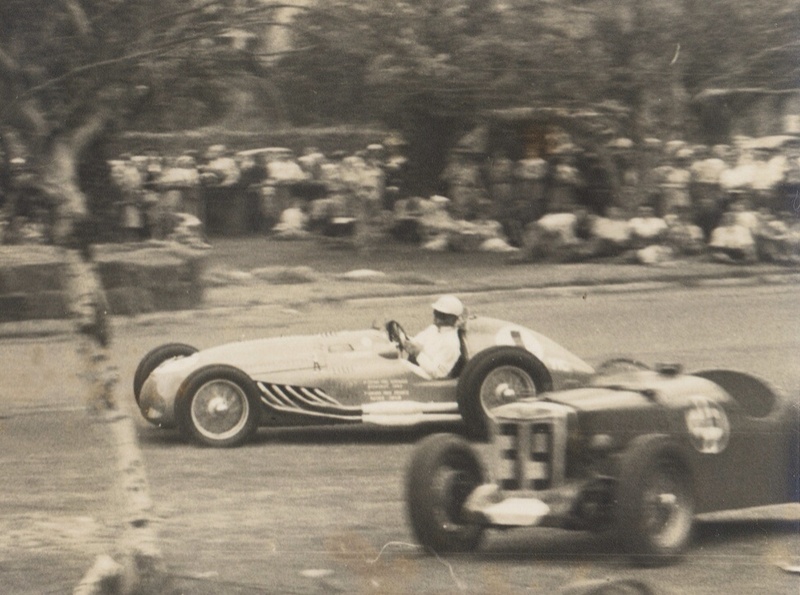 Since then Bob and I have joined the Automotive Historians Australia Inc (many of you would be interested in this several years old group, a topic for another time) and the two day AHA conference gave me the chance to twist Bob’s arm into contributing an occasional article or two. 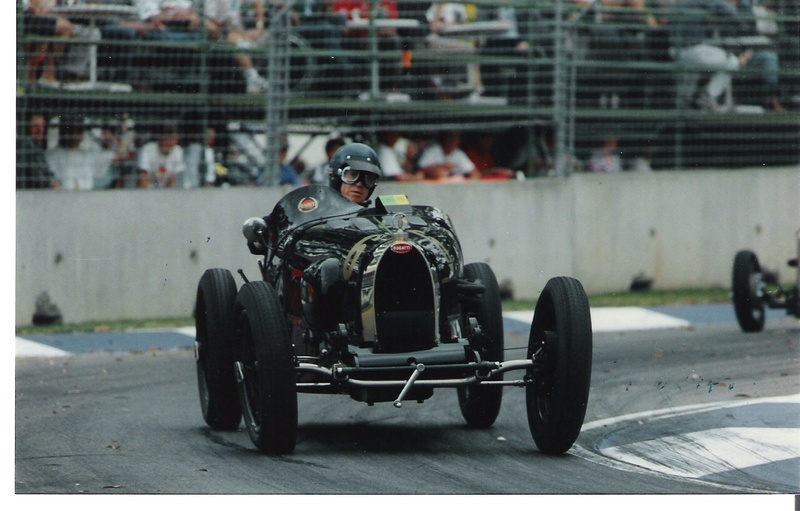 He is a retired medical practitioner who has had a lifetime interest in vintage and racing cars and Bugattis- his particular passion. 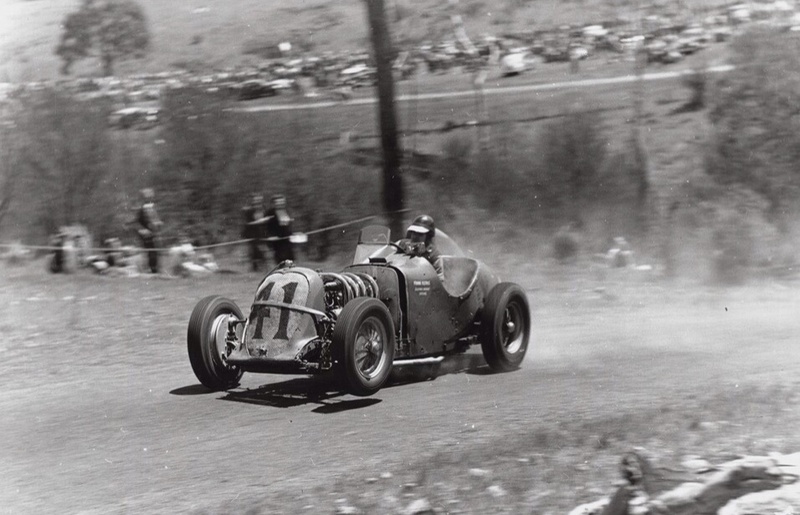 As well as racing and rallying these cars, he has maintained a deep interest in their history which culminated in the publication of three books on Australian (and New Zealand) Bugattis as well as one on the Brescia Bugatti. Bob has had historical articles published in many journals. 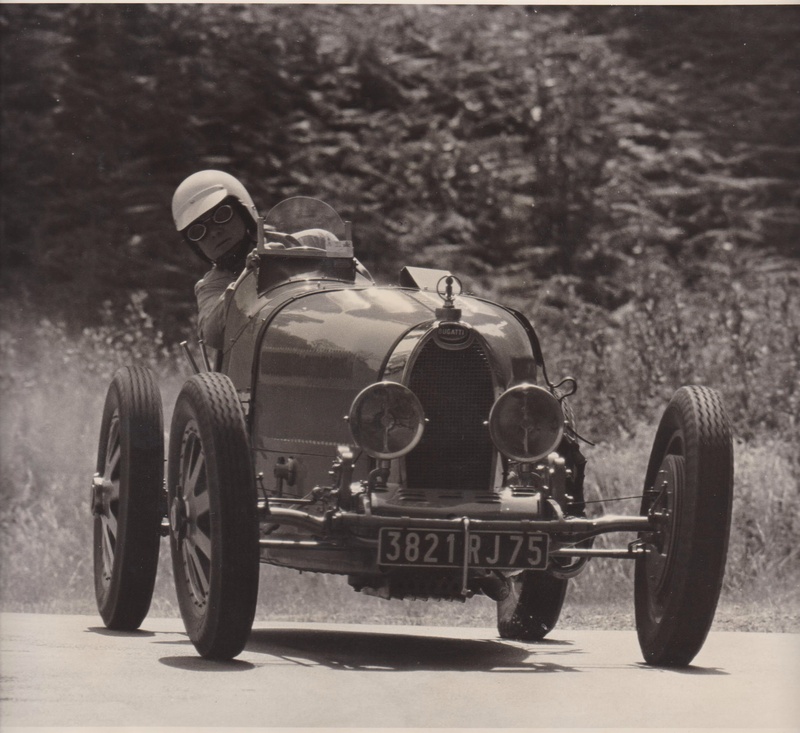 He continues to enjoy restoring and driving his small collection of a Bebe Peugeot, Bugatti T35B and an AC Ace. Anyone who is fortunate enough to have old copies of Australian Motor Sport (January 1946 to April 1971) will be aware of wordy advertisements for exotic cars imported by the Dale brothers: Peter Durham Dale and Henry K H Dale. Their origins are something of a mystery, but it is thought they had some Egyptian ancestry mixed with more recent English blood – Henry may have been born in England. They are recalled as two rather pompous single men who lived the life of gentlemen in a terrace house in Williams Road, Toorak in Melbourne. Well remembered is a large round ‘coffee’ table in the drawing room on which was displayed the latest copy of every motoring magazine. The garage on the side street was opened to reveal the latest, newly acquired exotica. 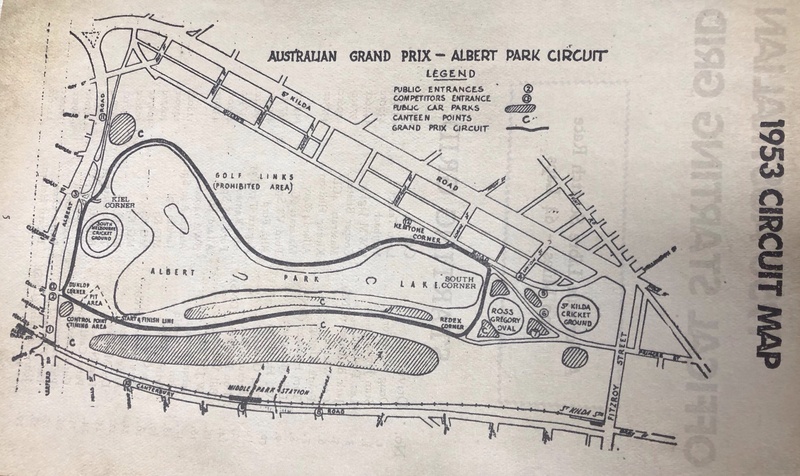 Peter, known as ‘Durham’ had some mundane job with an insurance company as well as being a journalist on the ‘Truth’ newspaper; he wrote a three part history of the pre-war Australian Grand Prix in AMS, which piqued the interest of the writer in these races. Henry, christened Hylton, was usually engaged in the wool trade in Egypt. 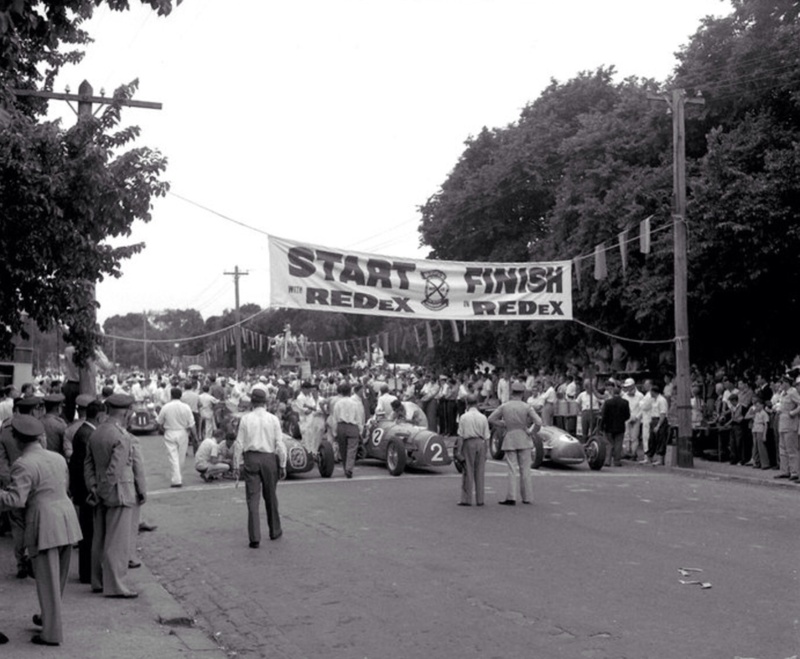 The writer’s earliest memory of Peter was at Fisherman’s Bend car races in the late 1950’s. A friend and I were gazing in awe at Miles Ryan’s 100mph Low Chassis Invicta. I commented to said friend that the radiator badge was not straight. We were addressed in a stentorious tone by one whom were later told was Peter Dale: “That is how you know it is handmade” – a lesson well learnt. We do not have a chronology of cars imported by the Dales, but let us start with three on a wharf. 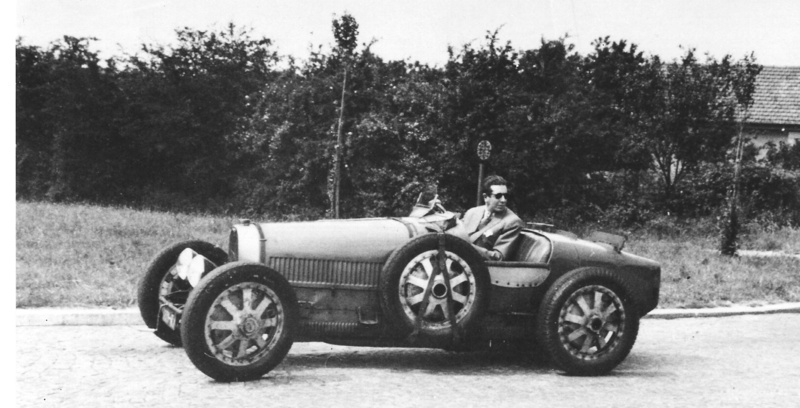 The Bugatti 35A is not an ‘A’, but a 1925 Molsheim works racing Type 35, chassis no. 4575. 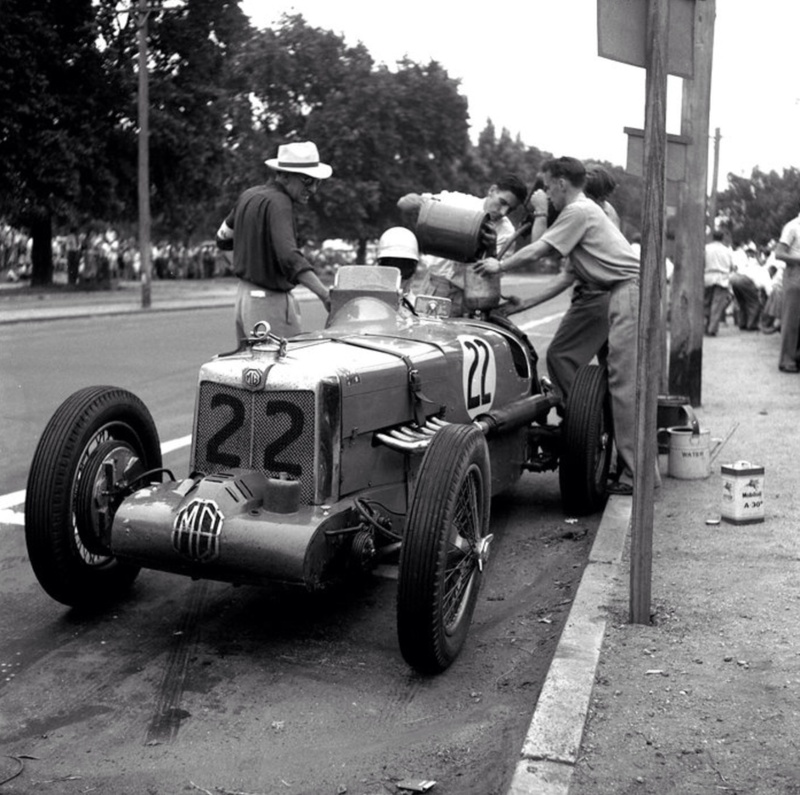 It was Jules Goux’s 2 litre car for the French and Spanish Grands Prix of that year. The French GP was a 1000km race held in torrential rain over 9 1/2 hours. 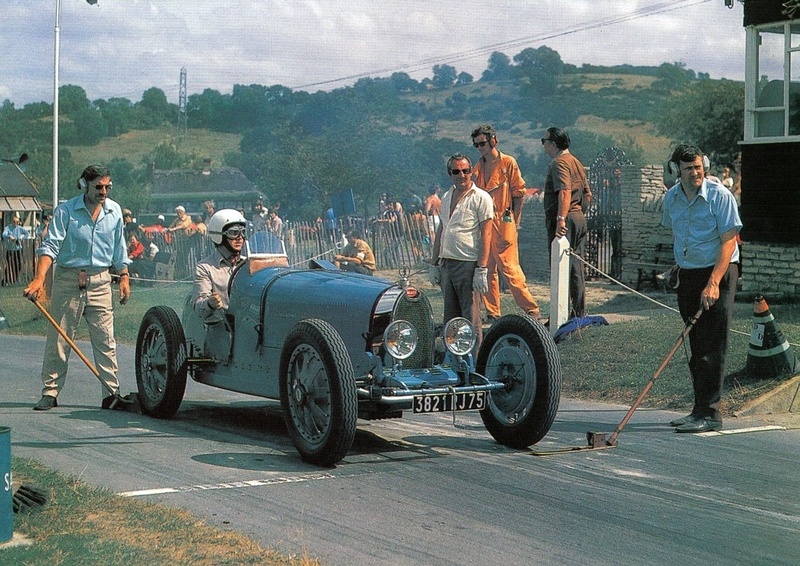 The Bugatti team finished intact with Goux in fifth place. What endurance. 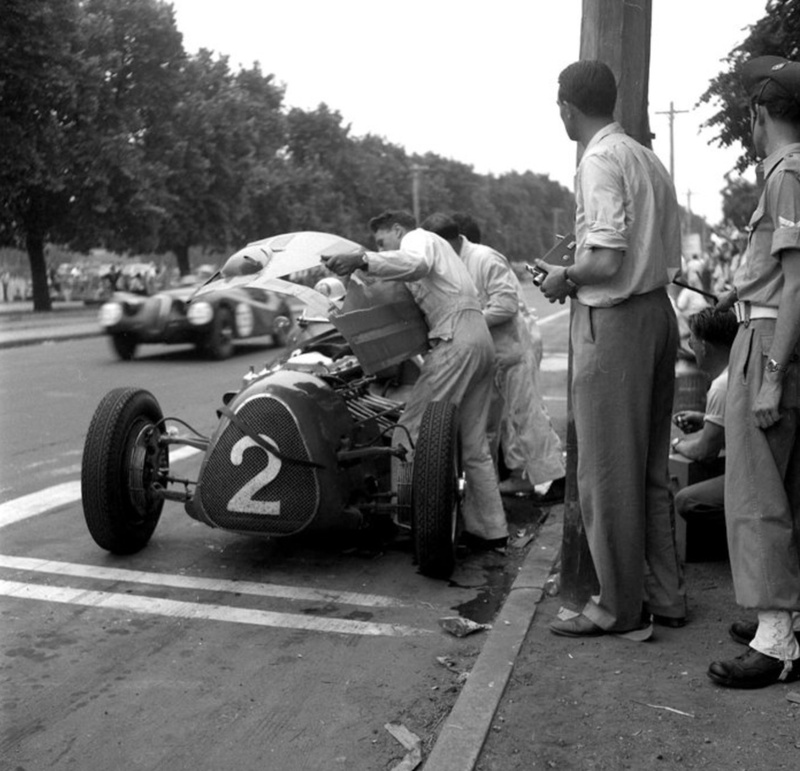 Henry spotted its radiator in the back of a garage in Neuilly-Sur-Seine in about 1950 and bought it for about $150. Although it had not been run since before the war, he had the oil changed and then undertook a delightful Autumnal drive to Marseille, from where the car was shipped to Adelaide. Peter collected it, had it registered by Bob Burnett-Read who actually substituted a Ford Prefect from his used car lot for the Bugatti – the weigh bridge man seemed satisfied with this. 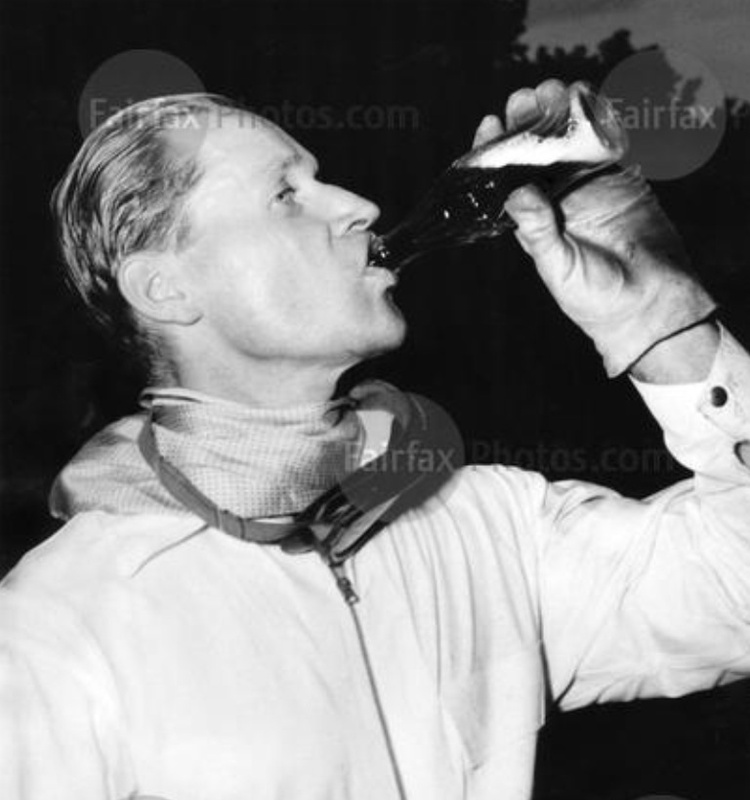 The car was driven by Peter to Melbourne and from there to Bathurst for the Easter races where it performed creditably in the hands of Lyndon Duckett and Peter Dale. They had driven there in a convoy of 4 Bugattis – the Type 35, the Anzani Bugatti, a Type 51A and a Type 57C – Dales ‘Ecurie Pur Sang’. 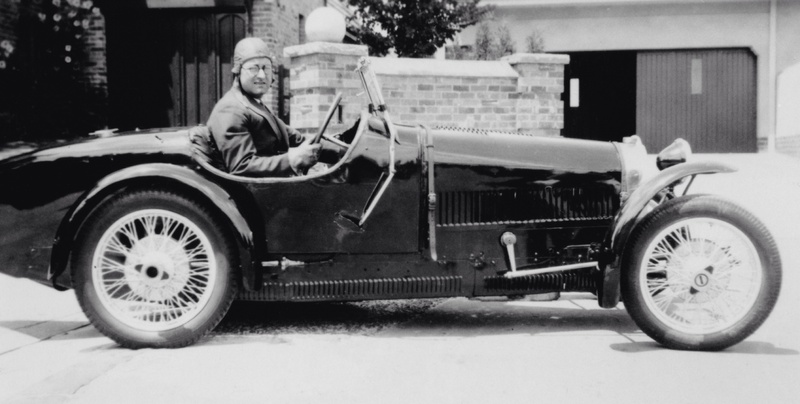 The next owner of the 35 was Bugatti enthusiast Herb Ford who sold it on when it emitted expensive noises from its roller bearing crankshaft. In the words of Peter, it was ‘a mass of fatigued stresses’. 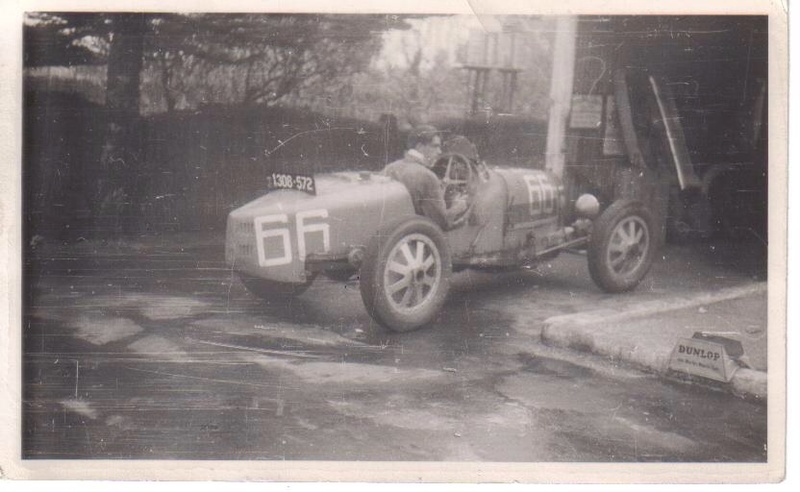 This photograph above is thought to be M Poret in the car pre-war, he was a Parisian owner. This photograph was taken shortly after arrival in Australia. 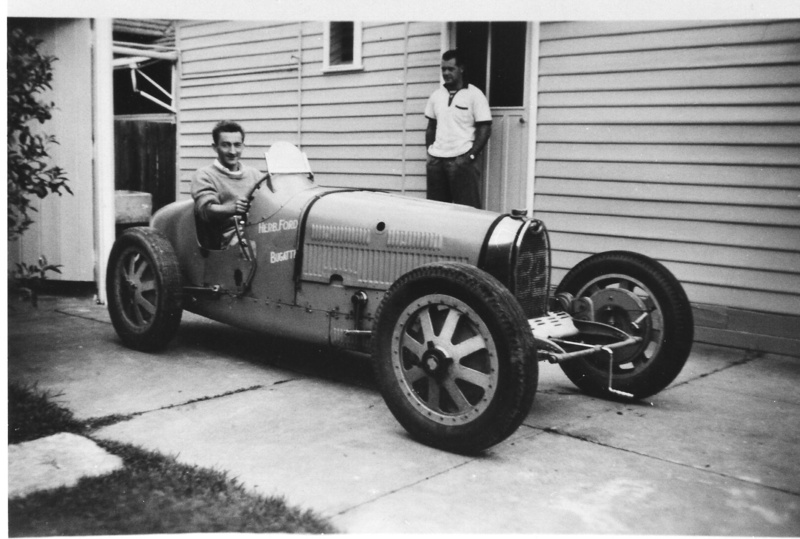 Bob Burnett-Read has just had the car registered prior to Peter Dale’s drive from Adelaide to Melbourne. 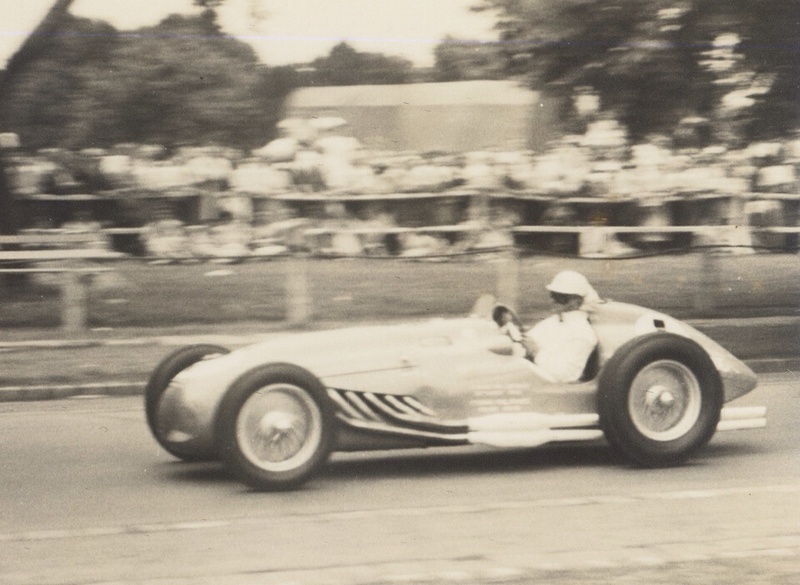 Herb Ford only used the car once or twice, including a sprint on or near the Geelong Road (accounts vary). 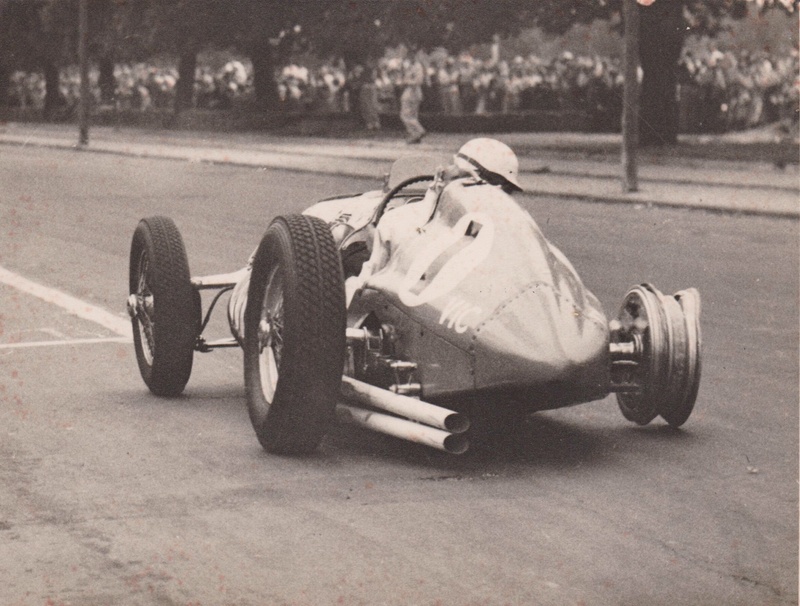 It is said he made the fastest 1/4 mile time- finishing at astronomical revs in third, maybe this is why the engine was making unpleasant noises. He sold the tired car to John Martin who did not keep it long enough to dismantle the complicated built-up roller bearing crank before passing it on to John Thomson. Here it is with Martin- note the ill-fitting bonnet from the 37A- when adding a supercharger to an unblown GP Bug, the steering box is moved up and back, to make space. Hence the steering drop arm being in the wrong place. The next owner, John Thomson had the good fortune to be friendly with Bugatti expert Peter Menere, at his Brighton ‘Pier Prestige Garage’. John was dead keen to have a GP Bug, and after prolonged and unsuccessful haggling with Ford, he eventually bought the dismantled car from Martin for an astromonical 870 pounds, the Brighton Buggattisti thought he was mad. 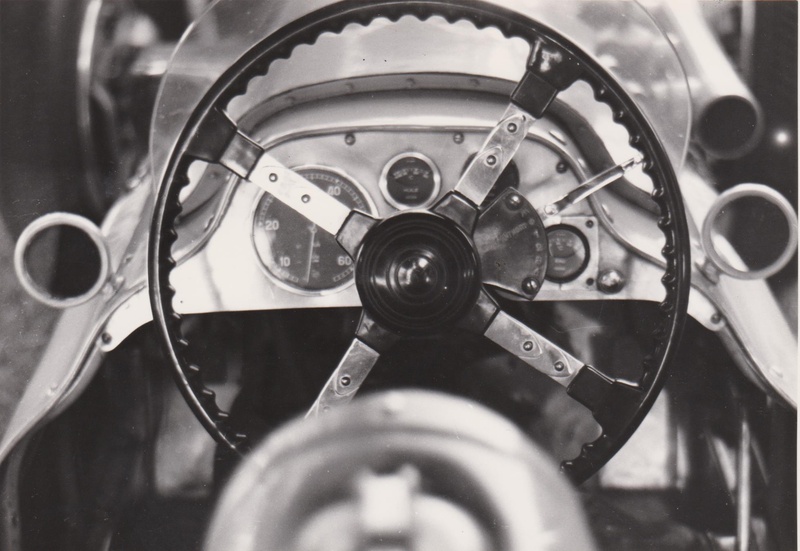 After spending a further 700 pounds with Moore Hydraulics getting the crankshaft ground, and untold hours toiling over the rest of the car, he eventually had a going car- an original, unmolested factory racing car, no less. Not long after completing the car in the mid-sixties John moved to London, the car following him in 1972. 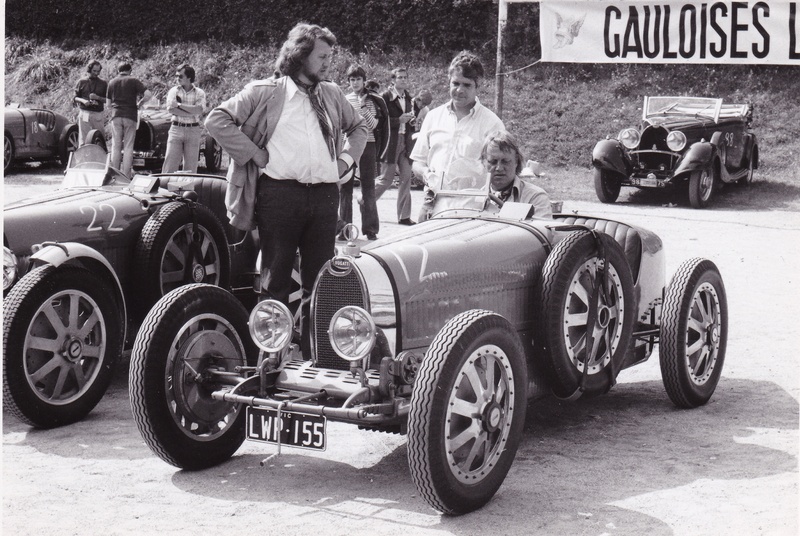 In 1974 50 years of the Grand Prix Bugatti was celebrated in Lyon with an amazing turn-up of Grand Prix Bugattis. John is seen in the car on that occasion. On the starting line at Limonest Hillclimb, Lyon. A well known photo of the Talbot-Lago ‘110007’ below but worth seeing again. 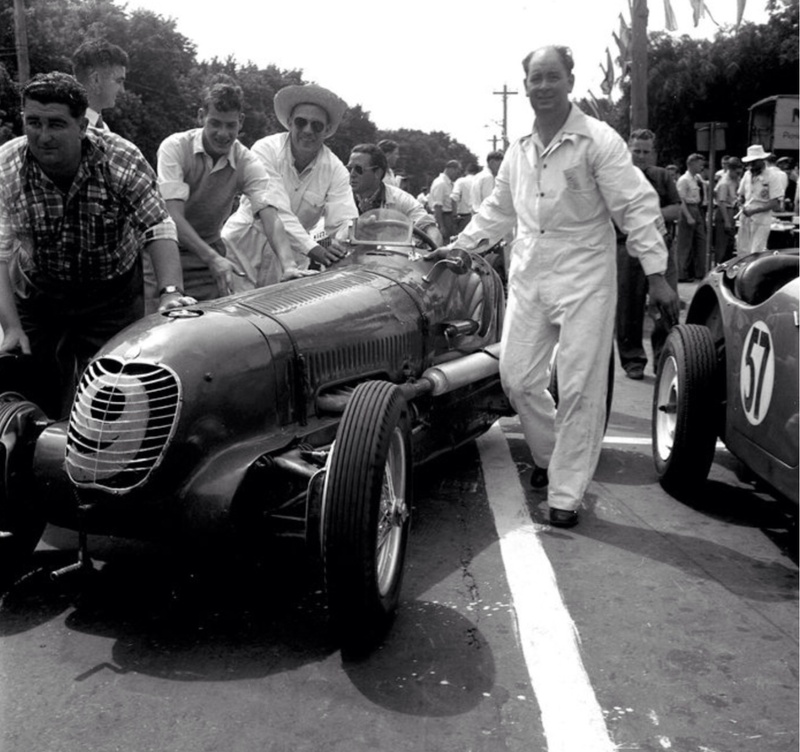 Doug Whiteford AGP, Albert Park, 21 November 1953 – ‘Yes Doug, your tyre is missing’. 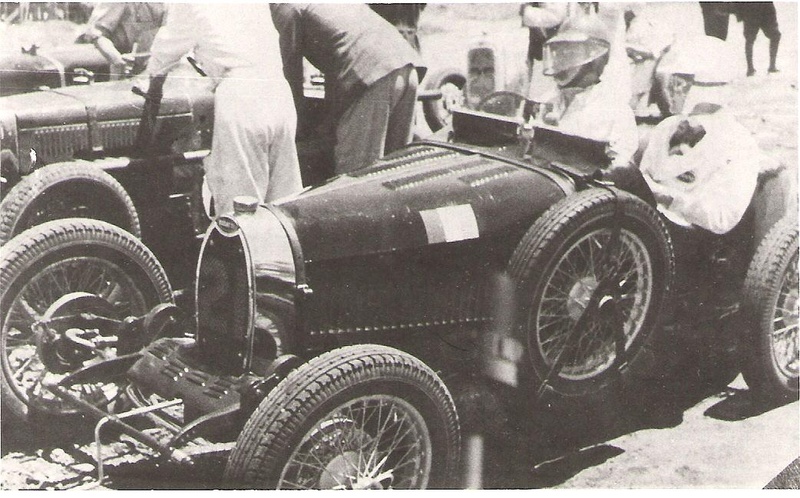 Lago Talbot GP chassis no. 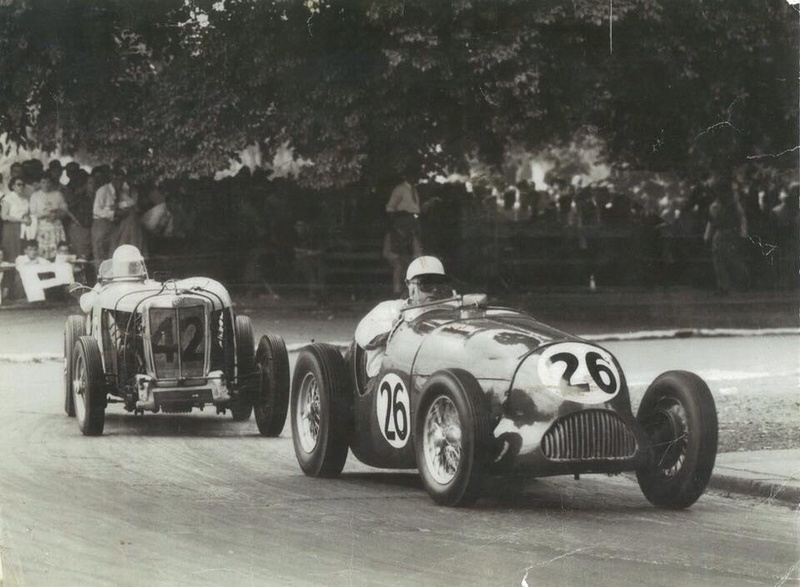 110007 was the car with which Louis Chiron had won the 1949 French Grand Prix. 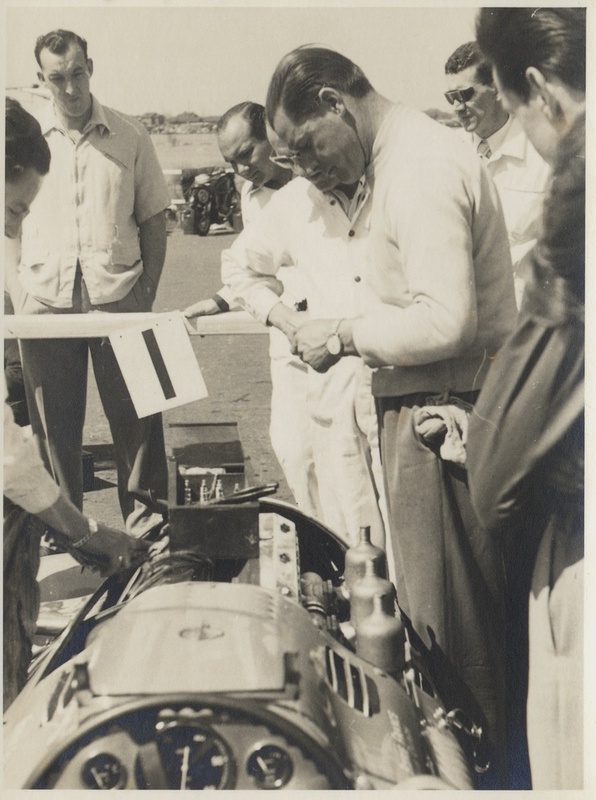 Henry was contemplating purchasing Raymond Sommer’s Lago, but was advised by Chiron to speak to Paul Vallee, patron of Ecurie France, as he might sell Chiron’s car which was being prepared for the Barcelona Grand Prix. It was entrained to Marseille and thence to Adelaide. 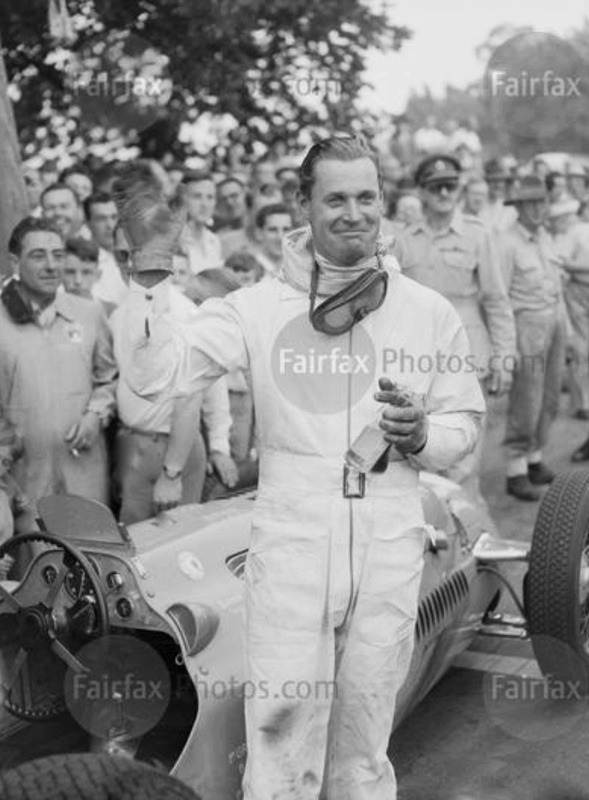 Its first owner in Australia was Tom (Happy) Hawkes who only drove it once or twice. 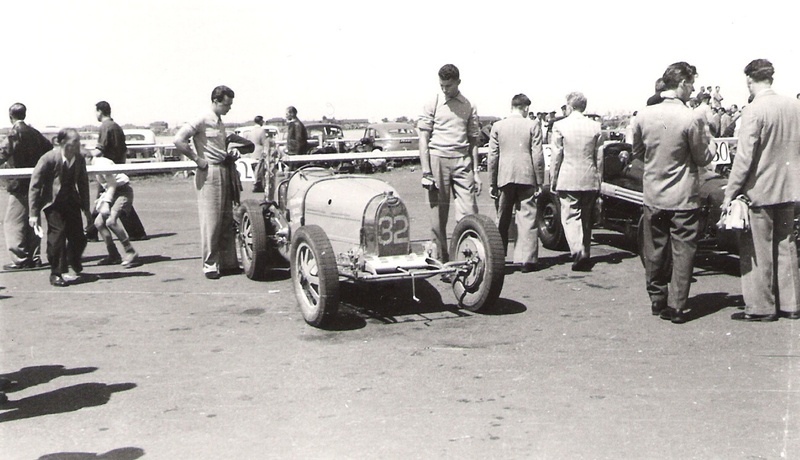 Its serious debut was at the 1951 Easter Bathurst meeting, 1951; Hawkes drove it to third in the Bathurst 100 and Whiteford was third in another scratch race, setting a new lap record of 3 minutes. 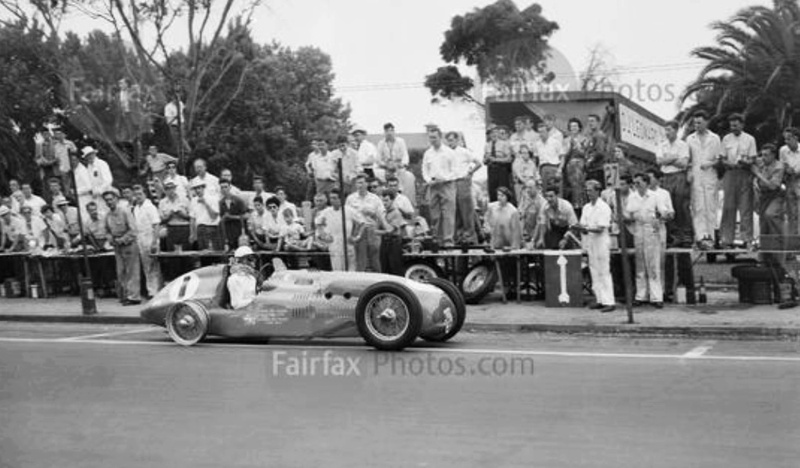 The ‘Maestro’ Whiteford won the 1952 GP at Bathurst and the 1953 race at Albert Park, in spite of the tyre issue. 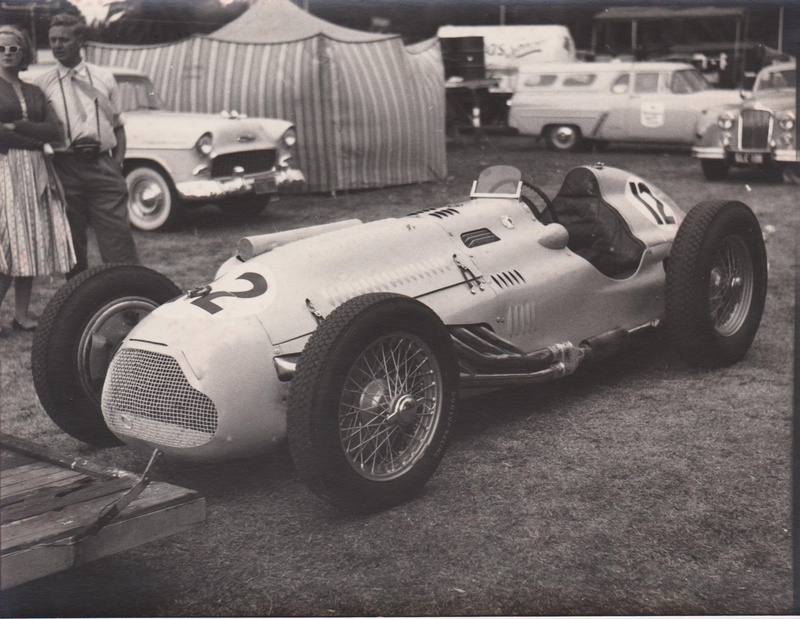 Here the car is pictured below during the December 1956 Australian Grand Prix weekend at Albert Park, by then the ‘6 plug’ chassis ‘110007’ was owned by Owen Bailey, whose race was shortlived with axle failure on the line. 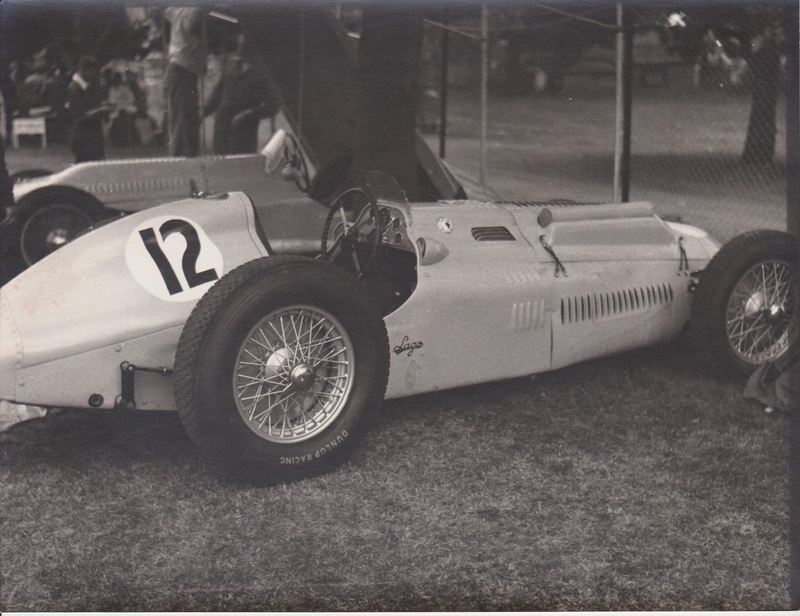 AGP Albert Park paddock with the ‘6 plug’ Bailey ‘110007’ in front of the car Doug Whitford replaced it with- an earlier car, chassis ‘110002’ but to more advanced specification inclusive of more powerful ’12 plug’ 4.5 litre motor. 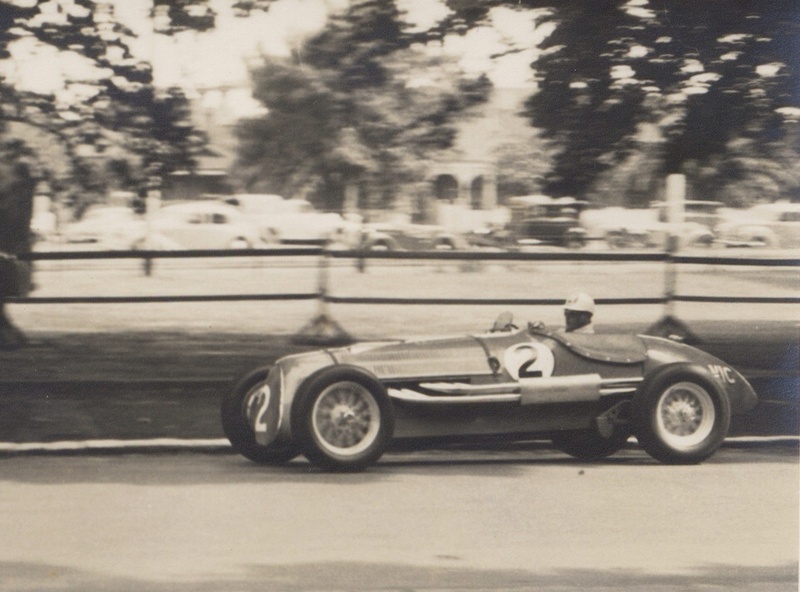 Stirling Moss won the feature race aboard a Maserati 250F. 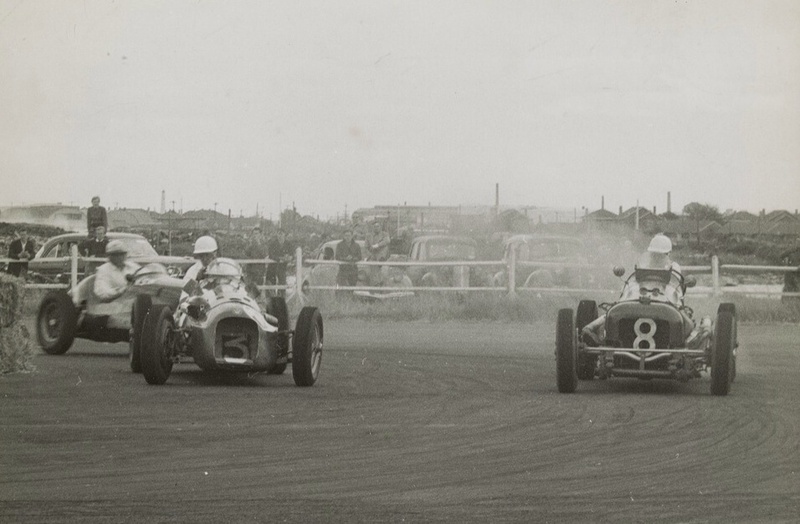 Beautiful shot of ‘Dicer Doug’ Whiteford with Peter Dale during the 1956 AGP carnival. Car is Talbot-Lago ‘110002’. It would be interesting to know how many AGP’s in total the various cars the Dales imported over the years contested. Cockpit below is ’12 plug’, ‘110002’, Spencer Wills photograph again taken in the Albert Park paddock. Quadrant for the pre-selector gearbox clear. 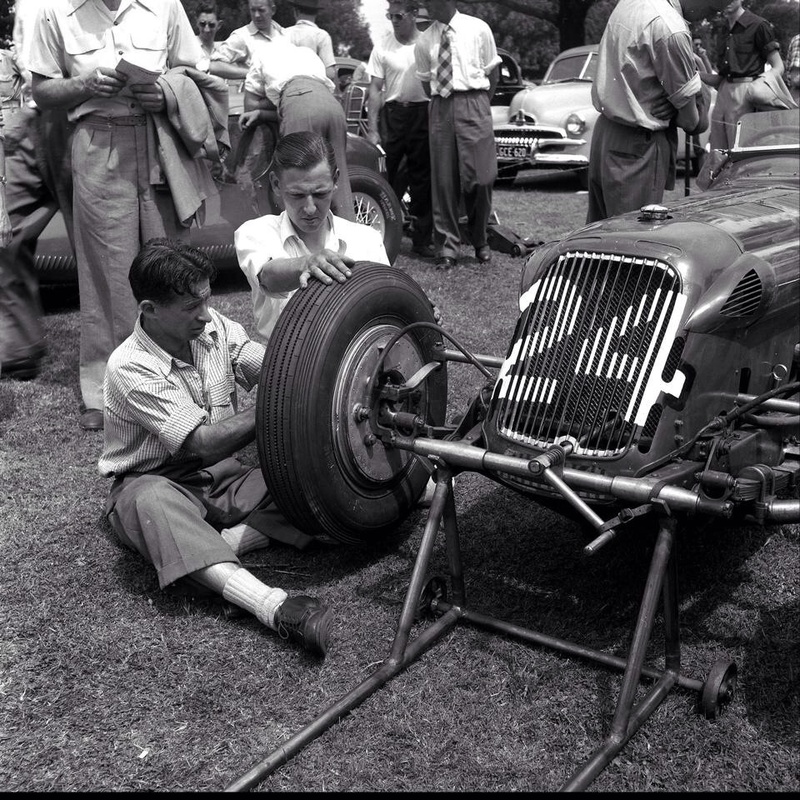 Photo below of Owen Bailey at Albert Park, am intrigued to know which meeting. It appears he has spun into a gutter, or been rammed from behind.- the shape of the dent suggests the former. Shot below is of Whiteford in the ’12 plug’ ‘110002’ at Fishermans Bend on 12 February 1956. 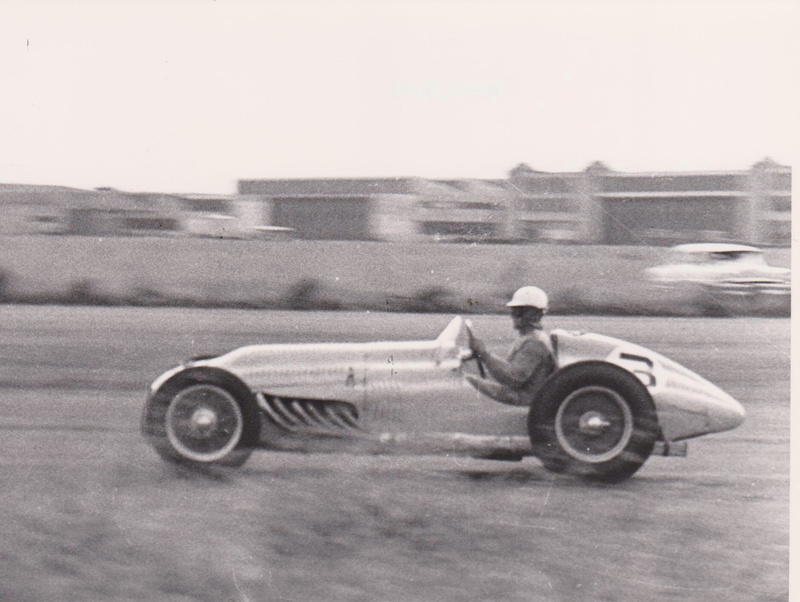 ‘The Maserati 4CL, chassis No. 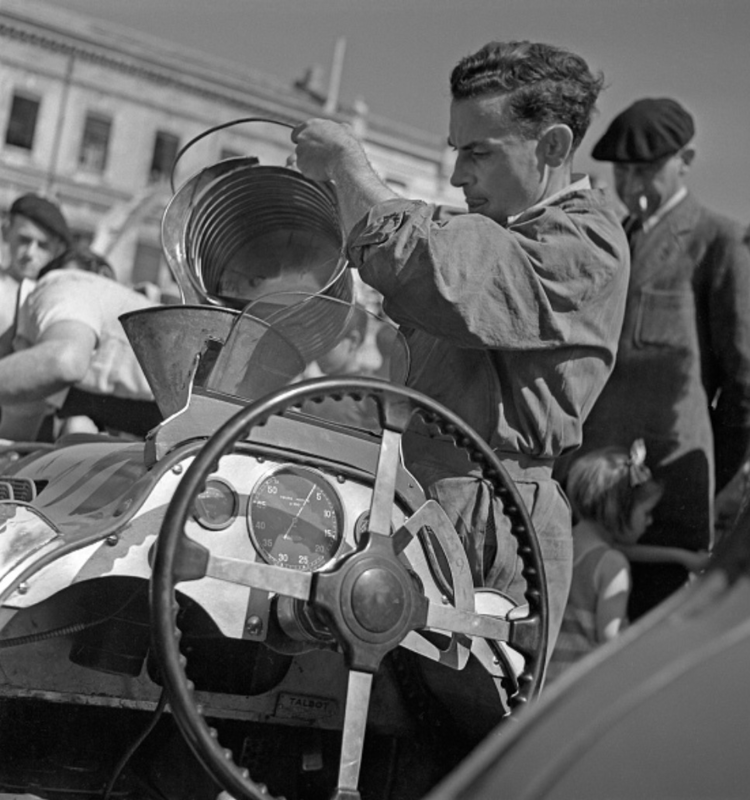 1579 is first recognised as Raymond Sommer’s 1946 Marseilles Grand Prix winning car. 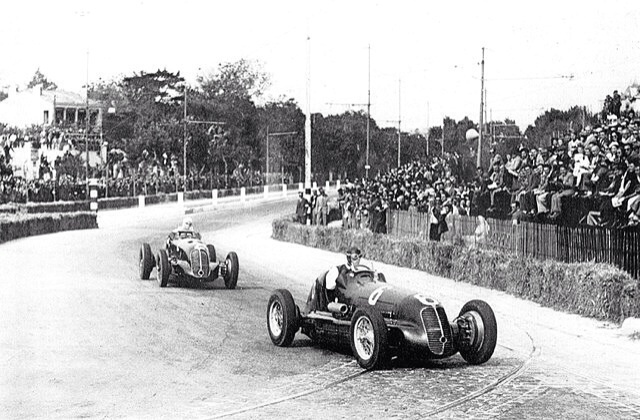 In the photo above Sommer is being led by Tazio Nuvolari in another 4CL during the second heat. 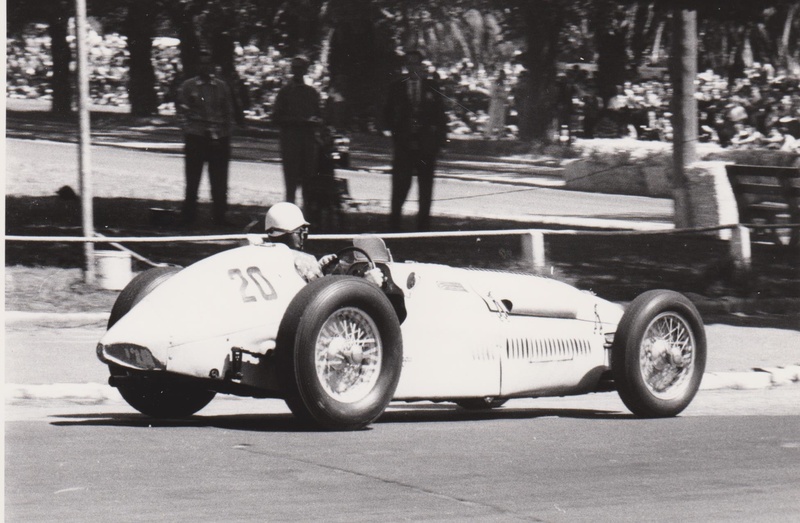 Sommer won both this 15 lap heat and 35 lap final, the great Mantuan failed to finish the preliminary and therefore did not qualify for the final run on the Marseille Prado Street circuit on 13 May. It was painted blue for its French owner. Again it was Louis Chiron who suggested Henry should buy it from Sommer’s widow – Sommer had been the owner of one of Europe’s largest carpet manufacturers. 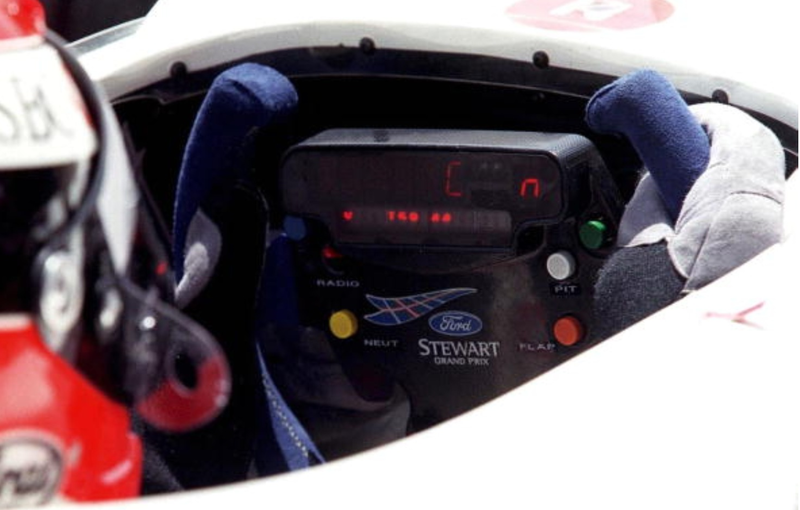 He retired from the race with transmission failure on lap 40 of the 65 laps, the event won by Mika Hakkinen’s McLaren MP4/14 Mercedes. Rubens Barrichelo was generally the quicker of the two Stewart drivers that season but Johnny broke through for the teams first and last Grand Prix win at the Nurburgring on 26 September. 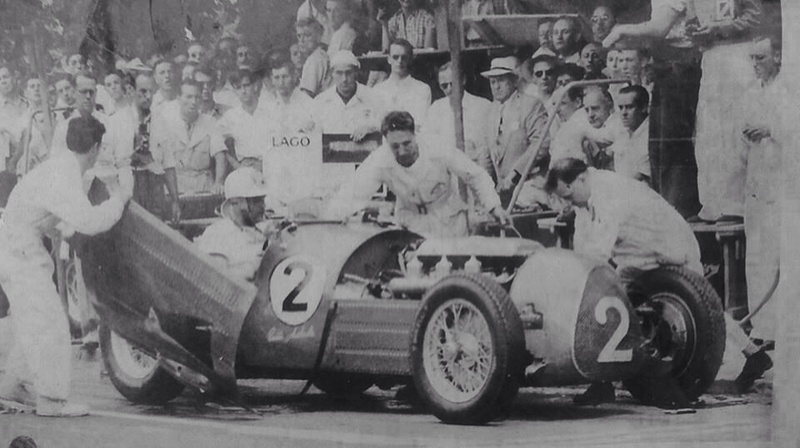 Fifty years before, the state of the art is demonstrated by one of the Talbot Lago T26C’s, being fuelled on the Albi GP grid on 10 July 1949, quadrant for the pre-selector ‘box and chassis plate clear below the wheel in shot. Wonderful image isn’t it! ?